Ideal for those who are always active, the MineTan Workout Ready Self Tan Foam infuses skin with a deep golden glow that won’t sweat off as you move. The innovative formula allows perspiration to move through it instead of letting it wipe away your tan, ensuring the colour stays smooth, even and seamless. Easy to apply and free from orange tones and the off-putting fake tan smell, this buildable formula will help you to achieve a Bondi Beach-worthy bronze that won’t budge. Suitable for all skin types and tones. 1. Apply to clean, exfoliated skin using our Bronze On Applicator Mitt. 2. Use sparingly on elbows, knees and ankles. Wash hands after application. 3. Rinse in lukewarm water after 1-3+ hours. Water (Aqua), Propylene Glycol, Dihydroxyacetone, Glycerin, Phenoxyethanol, Caprylyl/Capryl Glucoside, Sodium Lauroamphoacetate, Cocamidopropyl Betaine, Citric Acid, Sodium Citrate, Sodium Metabisulfite, Ethylhexylglycerin, Cetyl Hydroxyethylcellulose, Caffeine, Glycerin, Paullinia Cupana Seed Extract, Silica Dimethyl Silylate, Sodium Phosphate, Disodium Phosphate, Hydrated Silica, Red 40 (CI 16035), Yellow 5 (CI 19140), Blue 1 (CI 42090). 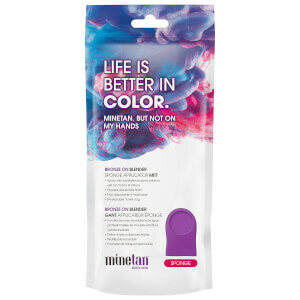 Receive a FREE MineTan Bronze on Applicator Blender Mitt when you spend £15 or more on MineTan.